Tired of dealing with neck tension or a headache? Are you pregnant and looking for a natural way to relieve the stresses and discomfort that affect all expecting mothers? Do you find yourself feeling anxious or depressed for reasons unknown and have tried a variety of methods to overcome it but to no avail? Are you seeking stress relief from the comfort of your own home? WELCOME to R & R Therapeutic Massage!!! 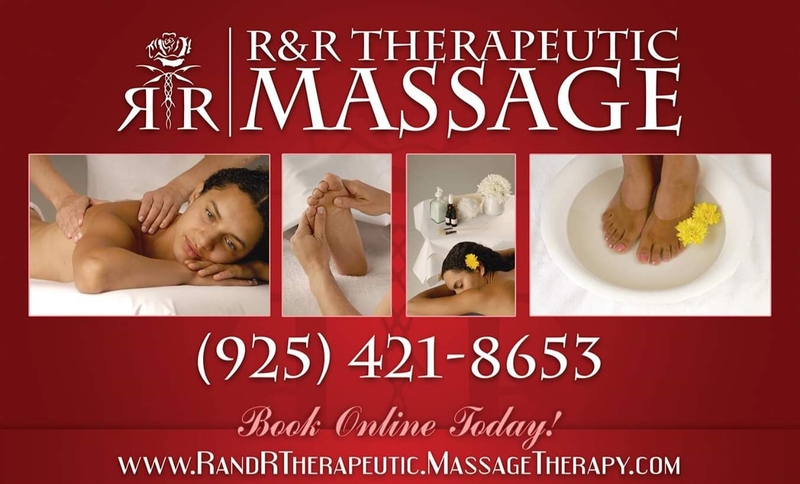 R & R Therapeutic Massage has set the bar in Pleasant Hill for professional massage by providing quality service. As the saying goes ‘practice makes perfect’ and our staff has had the time to refine its technique to a finely tuned art. We have specialists in almost all forms of massage therapy who constantly stay up to date on the leading advancements on the field. It is our policy at R & R Therapeutic Massage to have our staff get together once every month to refine their techniques by working on each other. Having the staff give positive criticism ensure that our clients only receive the best of care which is tried, tested and true. We take great pride in offering the people of the San Francisco East Bay a variety of different therapies; all found under one roof. Our personal approach to your mental and physical well-being has gained us a reputation as the most knowledgeable, but also accessible, massage therapy clinic in the area. If you are unable to visit our clinic, then a mobile therapist can massage you from the comfort of your own home (within the city of Pleasant Hill). We understand that if you have never had a massage therapist work on you then you may not know which therapy is best for your particular need. We offer free consultations where we sit down with you, go over what your expectations, and requirements are; then tailor a therapy session to your exact specifications. If you are just looking for a general relaxation session then we offer bundle packages where you can get a full body treatment including aromatherapy, hot & cold therapy, or another add-on of your choosing. Come and experience something new or the same traditional techniques; if you are seeking relief from muscle pain then R & R Therapeutic Massage has you covered. With so many different modalities and techniques in the same place we guarantee that we have something to relax your body and sooth your mind. All massages and body treatments are by appointment only! Book yours today! Relocated to 70 Doray Drive, Suite 1, Pleasant Hill. © Copyright 2019 R & R Therapeutic Massage. All rights reserved.